A new race of the downy mildew pathogen (Peronospora farinosa f. sp. spinaciae = P. effusa) on spinach was first identified in 2014 in Yuma, Arizona, U.S. This race was able to overcome the resistance of important spinach varieties. First, one isolate (UA1014), was characterized on a standard set of differential varieties. Subsequently, isolates with the same reaction pattern on these differential varieties have been found in numerous locations and each year since 2014. After careful evaluation of the significance of this development to the spinach industry, the International Working Group on Peronospora in spinach (IWGP) has denominated isolate US1602 as Pfs: 17. This isolate is available at Naktuinbouw in The Netherlands. 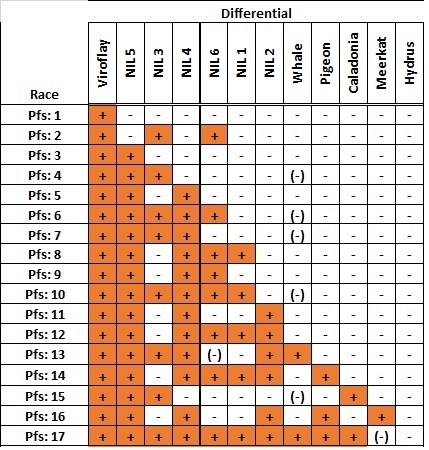 Race Pfs: 17 is able to infect the differentials NIL1-6, Whale, Pigeon, and Caladonia. Meerkat has intermediate resistance. The reaction of Meerkat can be variable in seedling tests. Hydrus is resistant. The IWGP is continuously monitoring the appearance of strains of the pathogen that deviate in virulence from the known races. In this way the IWGP aims to promote a consistent and clear communication between public and private entities, such as the seed industry, growers, scientists, and other interested parties about all resistance-breaking races that are persistent enough to survive over several years, occur in a wide area, and cause a significant economic impact. The IWGP is located in The Netherlands and is administered by Plantum NL. The IWGP consists of spinach seed company representatives (Pop Vriend, Monsanto, RijkZwaan, Bayer, Takii, Sakata, Bejo, Enza, Syngenta, and Advanseed) and Naktuinbouw, and is supported by research centers at the University of Arkansas. Spinach researchers over the world are invited to join the IWGP initiative and use the common host differential set to identify new isolates. For more information on this subject you can contact Jim Correll (jcorrell@uark.edu), Diederik Smilde (d.smilde@naktuinbouw.nl), or the IWGP chairperson Jan de Visser (JandeVisser@popvriendseeds.nl). Table with disease resistance reactions of spinach downy mildew races on IWGP differentials. Differentials and type isolates are available at Naktuinbouw in The Netherlands.